Carrie Carmichael excels at creating the perfect wedding. But when it comes to romance, the wedding coordinator is always on the sidelines. After years of pining for the town warlock, she’s finally ready to take her shot. But an old love spell might just derail her plans. Austin McKee has the magical touch—literally. His kisses are enchanted. And when an old flame shows up on the island to marry another man, suddenly the old enchantment rears its head and she’s ready to pick up where the two left off. Desperate to escape the spelled bridezilla, Austin plays along when Carrie pretends to be his fake girlfriend. But now lines are being blurred and Austin’s not at all sure he’s pretending. A laugh and a happy ending! Sometimes you need a quick light read that makes you laugh! This is it. With the situation that Carrie and Austin find themselves in, not to mention Brinn along with Austin’s mom and boyfriend you’ll be sure to have some great laughs along with that happy ending everyone waits for! A great read! short sweet funny light witches romance. Easy enjoyable read. Voluntarily reviewed. Another fun light read from Deanna. 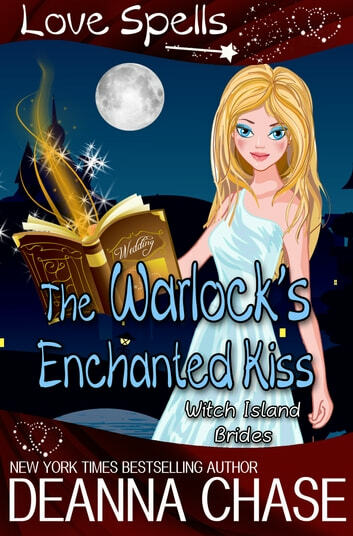 Carrie Carmichael is the local bridal consultant for Witch Island who has had a huge crush on the resident warlock Austin McKee for the past five years. Austin has a crush on her too; unfortunately, because of a spell that was placed on him he is unable to kiss her without dire consequences. Deanna has once again written a light story that is romantic, funny and keeps you entertained. The chapter with Austin at the bar with the sisters fighting over him had me laughing out loud. Carrie and Austin have a great love story that I would love to explore more. I do wish these stories were longer, I get so involved with the characters and then it’s over. Can’t wait to read the next installment. Just what I expected: greatness! This novella is just what the doctor ordered if you need an uplifting, fun time! Carrie and Austin are star-crossed, or should I say curse-crossed, almost-lovers who finally find their way to each other. The trip there is fun, romantic, and laugh-out-loud funny. Ms. Chase continues to impress me with her writing whether it is a short story or full-length book. Great story, great plot, and great characters abound in this entry. Don’t miss this if you love a romantic comedy or are just a fan of this author in general; I’m starting to be convinced this author can’t write a terrible book (don’t take that as a challenge!). Highly recommend! I was provided the e-book which I voluntarily reviewed. Love this series. The characters are so fun. In this story, Carrie and Austin are best friends who have a great attraction to each other but cannot be together. This is due to Austin having a kissing curse put on him years before. They need to work together to find a way to break the curse, so they can finally be together. This was a fast read, but had laugh out loud moments, as well as romance. Thoroughly enjoyed it!